Robert Landry biography provided courtesy of �California Watercolors 1850-1970� By Gordon T. McClelland and Jay T. Last. Robert Landry (1921-1991)...Born: Washington, D.C. Studied: Abbott Art School, Art Instruction, Inc. Member: San Diego Watercolor Society, Watercolor West. Robert Landry attended high school on the East Coast then went into the service during World War 11. After the war, he studied art in Washington, D.C. and Minneapolis on the G.I. Bill. This led to work as a commercial illustrator for the United States Air Force Graphic Arts Division at the Pentagon, and as an art director for the Federal Aviation Agency and Convair Astronautics. After the late 1940s, Landry began a serious painting career and started exhibiting fine art watercolors. His paintings often depicted regional subjects with buildings, boats or coastline structures. Creating a "mood" was important to him and gives his works a narrative quality. Robert Landry's watercolors were primarily sold through art galleries in San Diego and Dallas. 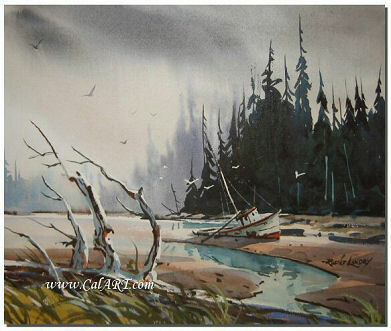 Landry also became a well known instructor at watercolor workshops near his home in San Diego and in traveling workshops held in Oregon, Arizona and Hawaii. Interview with Phyllis Landry, 1996. Robert Landry California Style Coastal Watercolor. Signed lower right...measures 11" x 14" and is in pristine condition.